Soft Surroundings is committed to keeping you cozy and comfortable all year round. That’s why we’ve put together a stunning assortment of women’s jackets and dress coats that offers something for every taste and temperature. In fact, many of our outerwear items are exclusive to our brand. Jackets are a staple in every woman’s wardrobe: From lightweight jackets that can be worn indoors and out, to cozy parkas and bombers, we have you covered in rich solids, playful prints, and gorgeous plaids. The same goes for our dress coats: You won’t mind covering your favorite dress with these beautiful creations. 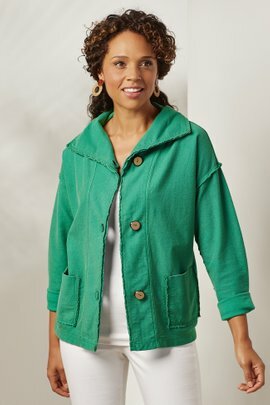 As you’ve come to expect from Soft Surroundings, these women’s dress coats and jackets often incorporate unique embellishments and intricate patterns. We’ve also applied our Softness Rating to each jacket or coat so that you can know what to expect from your garment, even when you order online.